OMEGA RTD Pt100 elements can be used for a variety of temperature measurement applications. Models are available for temperature ranges as broad as -200 to 850°C. Dual element RTDs are also available for applications where two different instruments need to monitor the same temperature. 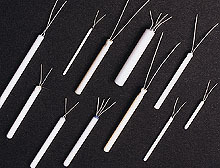 Nota: All RTD elements come standard with 10 mm bare leads. Welded insulated extension leads available, contact OMEGA for details.